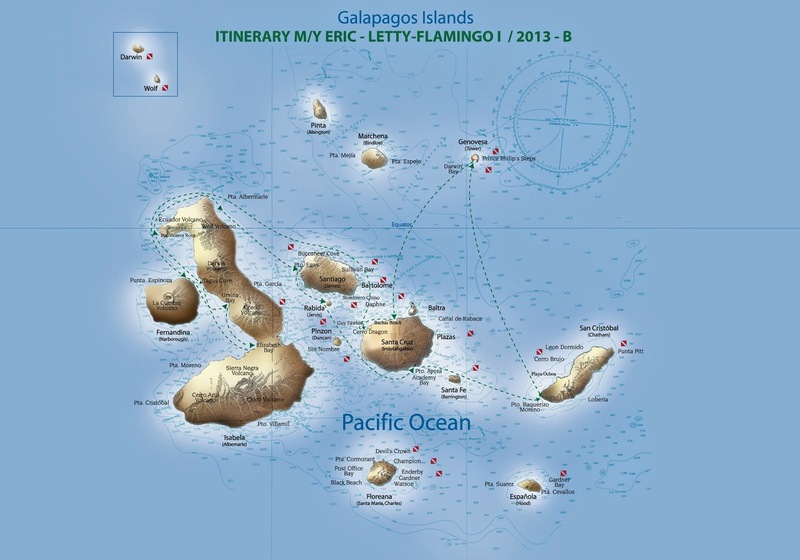 We recently went on a "bucket list", once-in-a-lifetime vacation to the Galapagos Islands. It was an amazing trip full of great memories, and here are some thoughts and observations to help anyone who may want to follow in our happy foot steps. Planning for this started approximately eight months in advance as our honeymoon, which we delayed to allow us to do something special. As we considered and rejected honeymoon ideas, we finally arrived at the conclusion that we should use this as an opportunity to do something that would be on a "bucket list" (i.e., things you desperately want to do before you die), if we had one and the Galapagos Islands quickly rose to the top. The Galapagos Islands comprise a national park for the county of Ecuador. Because of the profoundly important prominence of the wildlife on the islands, there are many protections and rules to navigate. The wildlife is scattered over numerous islands and coastlines. Before we can pick a tour company, we need to make a few more decisions. Good decision? I actually have no idea; it worked for our needs. I still am unsure if it would be bad to just travel there and try to set up stuff on your own on an ad hoc basis. I suspect that you would probably need to allow a lot more time to see everything if you did that, but maybe you would enjoy the greater exposure to the people that live there (we saw very little of them). And it is possible that it is practically impossible to execute those tours without the help of a company. I just don't know. That will likely become problematic quickly if both of us are not completely fluent in English. From our research, this necessarily meant picking a cruise that is slightly more expensive. But a Galapagos cruise is not inexpensive regardless and we only plan to go once, so we stacked the odds in our favor of a completely satisfying trip. Good decision? Fantastic decision. I cannot imagine having the same level of experience and education without a guide fluent in English. NOTE: some sites will tell you that a smaller ship inherently means smaller tour groups. Yes and no. There is a regulation that no group can be larger than 16 people. In our case, we had 18 people on the ship, so our groups were generally 8-10 apiece. I am not sure there is a guarantee you will have the same with a small boat. We can mitigate the sea sickness with medication and we did not care about the food. Better tours means a better chance at the most fulfilling experience of the flora and fauna. Our goal was to maximize experiencing the natural wonder of the Galapagos Islands, so this was an obvious choice for us. Good decision? Uncertain. I liked that we were able to get to know every other passenger and that everyone knew each other by name. However, a lot of the problems we encountered probably would not have been a problem on a larger boat (see the discussion about #6, below). You need to decide for yourself what makes sense for you. We went for a week-long tour (specifically, 7 days, eight days and seven nights), because we plan for this to be a once-in-a-lifetime experience and we want to see everything that matters to us. We were on Itinerary B. According to this web page, the park requires a 10-14 night cruise to see all of the possible sites. Good decision? We are pretty happy with our decision. In fact, we actually passed on the last hike. We found the Charles Darwin Research Center and Interpretation Center to be sad and anticlimactic after seeing everything in the wild. It was like going on a jungle safari, then visiting the zoo; mostly weird. I would happily have dropped both of those visits. I am certain we could cut a day or two off of it and still be happy, but this covered everything we wanted to see. I was completely ready to go home on day seven, myself, so I fear I might have actually been bored/restless by day nine or ten. So, yeah, if you have time and money to spare, a longer stay *might* be fun, or perhaps you could tour the islands more leisurely. Our tour was still somewhat leisurely (every day there was some sort of extended break and we were always back on the boat for meals and snacks), but perhaps you could squeeze in more snorkeling, which was our favorite part of the trip. I feel we would worry about missing out if we only went with a 4-day tour, though, so I would not recommend that unless it is easy for you to go back again and you plan to do so. If this is going to be your once-in-a-lifetime trip, I would argue vigorously against a trip of less than six days. For us, this was chiefly determined by 1) work scheduling and 2) weather in the Galapagos. Here is a page that talks about it somewhat extensively. We opted for the "dry season", which has the most activity among the sea mammals, but 90% of our choice was related to timing around work. Good decision? For us, June was great. The water temperature for snorkeling was fantastic and we saw, and swam with, more amazing wildlife than we had dared imagine. It's not like Consumer Reports tests Galapagos Islands tours, and it's actually hard to find many people that have been to the Galapagos, let alone frequent travelers that can contrast and compare different companies. So, we had to fall back on raw internet research. It's quite a jungle of information out there and because there is no Yelp-like entity for this, you end up taking an educated guess, at best. Good decision? It was good, but there were things that could have been better. Let's start with the good and great stuff ("great" > "good"). The guides were great, the staff was courteous and helpful, the boat was nice, the tours were great, the snorkeling was fantastic, the food was good, the rooms were kept immaculately clean, and the view from our cabin window was great. However, the climate control was crappy throughout the trip. The first two nights, our room got up to 80 F and our trip average was probably 76 F. We only saw 70 F once in the wee hours of the morning. "Fixing" the problem usually involved turning off all air conditioning in the boat for hours. And yet, the lounge was always at 68 F and many of our fellow passengers reported having rooms getting too cold. I recall someone reported that their room got down to 63 F one night (they had turned their A/C to "on" instead of "auto"). A few of the nights and days involved fast, long trips from one island to another (see the itinerary map above). Those were really rough. Objects were flung from tables, we heard dishes crashing in the bar downstairs, and it was really hard to sleep well through the tossing and turning. Seasickness medications were absolutely vital. It is worth noting that we were in one of the four cabins on the topmost living level, which means that we feel the motion of the sea the most. But it also means no kitchen noises or possible engine sounds and smells. They had exactly one person serving all 18 of us, to include taking orders, running food, and both making and serving drinks. Not surprisingly, that led to sparse service. The greatest tragedy was that the wine flowed *very* slowly. Everyone on the boat greatly favored potato chips as a snack food (and tummy stabilizer against queasiness), and even though that was readily apparent, we ran out of those too. When some wasps invaded the sundeck, which is one of only two common areas for lounging about outside of your tiny cabin, they asked us to simply avoid them. That resulted in many stings, which people reported were surprisingly painful (with remarkable swelling in some cases). They clung to the boat when traveling, too, so they were not going away. Eventually, I went up and solved the problem with a flip flop and ninja-like reflexes. I would have expected the crew to resolve that before people were stung. It is worth noting that these wasps were not special, endemic creatures of the Galapagos that needed to be preserved/protected; rather, they are invaders to the region. I can believe that the problems we encountered were mostly avoidable (perhaps not the rough ocean travel). Would I do it differently if I had the chance? I do not know. I might look into the larger cruise ship. However, we enjoyed the small ship experience overall, so I cannot say with certainty if we would make a different choice. And let's be clear, I am not trying to suggest it was a horrible trip. I will say it again - The guides were great, the staff was courteous and helpful, the boat was nice, the tours were great, the snorkeling was fantastic, the food was good, the rooms were kept immaculately clean, and the view from our cabin window was great.